In 2009, I decided to limit my blog to around one post a day. I wrote as many notes as I wanted in a private text file, and selected only one or two to share each day. People liked the new frequency. They found it more manageable. Instead of getting three or four e-mails or feed items a day, they got one or two. I liked the new frequency too. I started shuffling blog posts around depending on how useful I thought they would be to others. This was generally a good thing, as I put off publishing slice-of-life posts whenever I had tips to share. Sometimes, though, I ended up with “stale” blog posts that I wanted to share but didn’t. In a medium as current as a blog, it seems weird to write about something that happened three days ago. After a few tries at keeping a scheduled queue of posts in my WordPress blog, I turned to keeping the posts in my Org file instead because it was easier to choose which post to publish than to keep shuffling dates around in WordPress. Sometimes I’d post more than one blog post anyway. Looking at my double- and triple-post days, most of those posts followed up on conversations, and I’m glad I posted them when I did. If I’m writing something that I think might be generally useful, I’d rather blog it than keep it in e-mail. Whenever I tried to stick closely to my one-post-a-day rule, I found myself postponing responses instead of, say, copying and pasting the relevant tips into an HTML mail. Postponing responses didn’t help with Inbox Zero or quick conversations, so I often decided to just go ahead and post. Rhythm can make or break an asynchronous conversation. Rhythm affected my writing, too. Whenever I had plenty of many scheduled posts lined up, I found myself spending days without writing. While there were days that I welcomed the extra time, it was throwing off my routines. I felt like I was binge-writing: gorging myself on writing, then putting it off until the need to write and think drove me back to the keyboard or the pen. There were very few dull days that passed without a story, a lesson, or an idea I wanted to share, so although I was trying to keep to one post a day, I itched to write more, and new items often pre-empted things in the backlog until those things were no longer relevant. It’s a tradeoff among different people’s needs. On one hand, posting short tips frequently would benefit conversational partners as well as searchers. On the other hand, posting too frequently would give subscribers negative value. I guess the chart looks a little like what’s on the right – but what were the numbers? Would subscribers get impatient with two posts a day? At what point would searchers get diminishing returns from posts that were too sparse and quickly written? And what about what I wanted from my blog – a way to remember and share life? I found myself posting more generally useful posts about writing and blogging instead of ephemeral memories, glimpses of life – but I loved the chance connections I had when I wrote about things like burning pancakes or planting in the garden. I’d hate to become yet another generic blogger writing bland, inarguable, and impersonal tips, or to write for what I thought might be the widest use when there might be interesting things to explore in the nooks and crannies of life. It’s a trade-off between other factors, too. 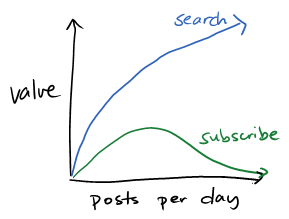 Should I write fewer posts, but longer ones? I like sticking to one thought per blog post, though. Maybe I should do “reader mailbag”-type posts, but that probably still requires more of a weekly routine, and I do like posting people-related updates within a day or two. I’d like to spend some time revisiting old posts or sharing my reflections on other people’s posts. How do I fit that in around the new things I want to write about? And I’ve been meaning to move time away from writing to other activities. Perhaps I’ll be more ruthless about prioritizing what to write about, and leave other unfinished ideas as drafts in my private notes – or maybe I’ll drop hints about things I’d like to think about, in case other people can point out things they’d like to learn more about as well. How often do I post more than one thing a day? Am I writing longer posts? How is that related to, say, the number of comments people leave on my posts? The red line shows the number of posts. 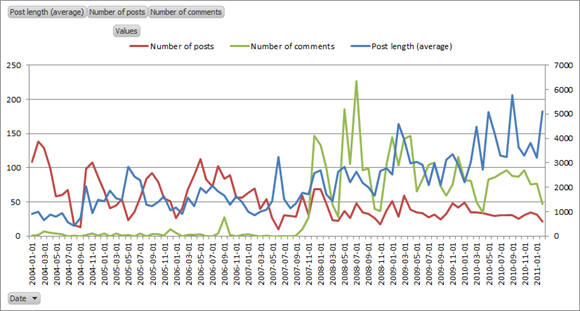 As you can see, I’ve gone from really spikey to a somewhat more consistent line hovering at around 30 posts a month. This means you can subscribe without fear, or check back roughly every morning. The blue line shows that my average post length (in terms of characters) is somewhat spikey, and it seems to be increasing. So, yes, I’m writing longer posts. It’s plotted on the secondary axis (0..7000) so that the other lines aren’t drowned out. The green line shows the number of comments. My spreadsheet doesn’t show any strong correlations with either my post length or the number of posts, so it doesn’t look like I’m scaring people off with long posts or too-frequent posts. As it turns out, I’m actually pretty good at keeping to around one or two posts per day. This year’s had an average of 1.1 posts per day, well within reason (and subscriber patience, I hope). Knowing this means I don’t need to spend a lot of time fiddling with this decision, although I do want to find the rough spots and figure out how I can smooth them over. I’m going to change my “normal” level to one or two posts a day instead of just one, which means I can feel less guilty when I post two or even three blog posts on one day. If I have multiple conversation follow-ups, I’ll combine them into a mailbag-type post instead of sticking to the one-thought-per-post guideline. This means I can get responses out in a timely way without ending up with three or four additional posts. I might build in more revision into my writing routines, so I can get better at writing and I can express things even more clearly and concisely. This could be the second post in a day if I don’t have any conversation follow-ups. If I’m disciplined about limiting my writing time and just doing quick descriptions of other stories/ideas I want to write about, then this could also be the time I spend reviewing those and fleshing those out. I’ll channel the rest of my darn-I-want-to-write-about-that-too frustration into drawing and other communication skills I want to practice. Have you come across this blog through a search? Do you read this blog regularly? Do you subscribe to updates (thanks!)? What would make it work better for you? What have you seen working on other personal blogs?